Mumia Abu-Jamal was convicted and sentenced to death for the 1981 fatal shooting of police officer Daniel Faulkner. After joining the Black Panther Party as a teenager, Abu-Jamal became a radical print and radio journalist, whose work on the MOVE organization and its confrontations with the Philadelphia police department and its notoriously racist Chief, Frank Rizzo, eventually led him to identify with the group. While in prison, Abu-Jamal has continued his work, writing books and audio recordings on Prison Radio highlighting the role of U.S. imperialism, international current events, American history, police violence, and the prison system. The legality of Mumia Abu-Jamal’s initial trial and the long appeals process have been seriously compromised. In fact, it was the finding that the original jury had been improperly instructed in the penalty phase which caused Judge Yohn to vacate Abu-Jamal’s death sentence in 2001. The current appeal is based on the potential conflict in the role of Ron Castille as both a DA and Pennsylvania Supreme Court justice during the appeals process. However, it wasn’t until 2012 that Philadelphia District Attorney (DA) Seth Williams announced that an agreement with the Faulkner family had been reached and the City would cease seeking the death penalty in the case. Williams’ successor, Larry Krasner, took office in January 2018 and is rightly seen as one of the most progressive DAs in the country. Before his election, Larry Krasner had established a reputation not as a prosecutor, but as a defense attorney, suing the Philadelphia Police Department 75 times. Activists involved in prison reform and abolition made up an important part of his upstart campaign. Socialist Alternative strongly supported the demands of the campaign that elected Krasner but warned of the limits of relying on a DA specifically and one individual generally to carry out the profound changes to the criminal justice system that we need. We called on his supporters to build an on-going movement to change both the law and how it is enforced. Krasner’s first year in office has been marked by a series of moderate reforms on issues like cash bail and the treatment of juveniles, amid escalating vitriol from the Fraternal Order of Police. In what could become the defining question of his tenure, Krasner last month turned over six boxes of previously unknown documents unearthed in a closet to Mumia’s legal team. However, Judge Leon Tucker’s ruling allowing Mumia’s appeal to go forward limited consideration to evidence which had previously been presented, presumably excluding this new material. 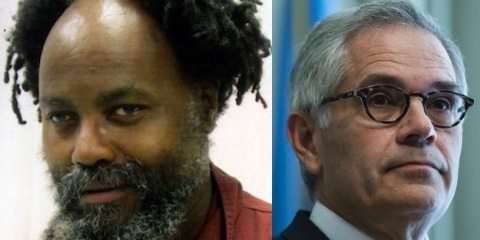 Socialist Alternative fully supports Mumia Abu-Jamal’s right to a new trial based on all the evidence, not just a technical rehashing of old news. But we would go further and say it is long overdue for Mumia to be released. He has spent 38 years in prison, most of them on death row, after being railroaded by reactionary forces. Thousands of not famous prisoners also share the right to a new trial – all those whose path to even the imperfect justice available under capitalism has been obstructed by institutional racism, police corruption and incompetence, planted drugs and weapons, lost documents, disinterested investigations, coercive plea bargaining and every other manipulation by those with power and money over those who do not. We call on Larry Krasner to boldly and actively apply the full power of his office to re-balance the scales of justice, particularly for those most affected, the thousands of working class people of color in prison and their families. Further, he must use the bully pulpit that comes with elected office to build the movements that could force changes to the law. Far too many Americans are in prison, on probation or on parole for non-violent offenses, the inability to post bail or pay fines and technical violations of rules designed to return them to jail. We must also demand no jail time for non-violent offenses, the repealing of all state level three-strike rules and minimum sentencing laws, and the release of all elderly prisoners who no longer pose a threat to the community. Thoroughgoing justice reform will require millions of working-class people becoming politically involved to change not only the individuals filling the seats of power, but also the whole damn guilty system of capitalism.